In a blinding flash of HTML5 and a cloud of CSS, hackasaurus has evolved into WebMaker! Proving that making the web better isn't just child's play. Attend an upcoming hack jam. Or organize a hack jam in your community. We're looking to spread to new cities beyond New York and Chicago. Get in touch through our mailing list. Start hacking with Hackasaurus tools like X-Ray Goggles. Share your own ideas, tools and resources. Through our community or on . Become a Hackasaurs partner. 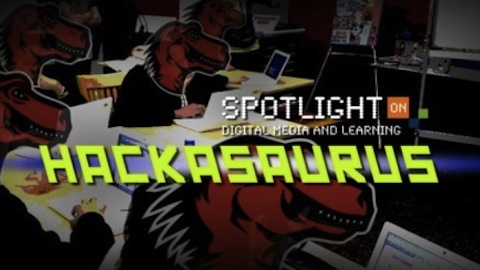 We're looking for learning centers, libraries, media centers and other partners to help design, develop and host Hackasaurus. Get in touch through our mailing list. Help develop the Hackasaurus tool set. Through our issue tracker and Github. Hackasaurus helps teens hack. Through tools that makes it easy for youth to explore, remix and redesign the web. Plus local events or "hack jams" that make hacking and digital literacy easy, social and fun. We're designing around the way kids learn technology, based on Mizuko Ito's concepts of hanging out, messing around and geeking out. Tools in development so far include HTML Pad and X-Ray Goggles, with more on the way. You can get involved by test-driving Hackasarus tools right now. Or attend an upcoming hack jam, organize your own event, help develop the Hackasaurus tool kit, or share your own ideas and tools. Hackasaurus Slides: An HTML5 remixable slide show. Hackasaurus "Hack Jams" are one-day and weekend events that allow kids to test and help design Hackasaurus. They're run through the New Youth City Learning Network in collaboration with Mozilla. Hackasaurus jams are designed to be modular and self-organizing. So that any teen, parent or organization can organize their own. Event curriculum and an organizing kit are under development. These tools are still evolving and have rough edges, but their basic functionality is available now. They're also actively being used at jams. "X-Ray Goggles" allow anyone to easily “see through the surface” of any Web page, and obtain an intuitive understanding of how pages are composed. They can be used anywhere on the Web one hangs out, and casual use of the tool enables one to gain a rudimentary grasp of HTML, CSS, and the Document Object Model. These don't necessarily have anything directly to do with Hackasaurus or the Web, but we've found them helpful or inspiring in other ways. ilearnedtoprogram.com - Testimonials from people who learned how to program. 826 National - See Atul's post on What Mozilla Can Learn From 826 National for more information on why this is relevant. X-ray Goggles: See what the web is made of. Mess around & remix. HTML Pad (aka "Magic Ink"): A simple website that allows anyone to easily create a Web page, collaborate on it in real-time with friends, and share it with the rest of the world. This page was last modified on 10 July 2014, at 02:53.